Last year I decided to take action to start saving money and one of the things I realised I needed to do was cut down my spending starting with the food shop. At one point I used to spend on average £80-£100 a week on our food shop and this was for myself, a toddler and a baby who both didn't eat much at all. Fast forward a year and I found myself in the exact same position and sat down to see where all of my expenses were coming from. My weekly food shop would be around the £60 mark but I would also be popping to the shops 3-4 times a week for extra things and end up spending £30-50 a time! With one month spending over £600 on groceries which is just ridiculous, especially for 1 adult, a toddler and a baby! I am pleased to say that I have managed to get the food shop back down to £40-50 a week which I am extremely happy with and am now saving on average around £150 a month which goes straight into my money savings tin or towards other things such as the breakdown cover or TV license renewal. I wanted to share with you how I managed to cut my food shop in half and how you can too by introducing a few changes to your lifestyle. The easiest way to waste less food and spend less is to sit down and write out a meal plan for the week. Decide on what meals you are going to eat, this doesn't have to be set each day, I like to decide what to eat that day but if you have a set number of meals written out you'll know then what items you need to buy and won't be overbuying. I now have a list of meals we enjoy eating hanging up in the kitchen for when I get uninspired as I can easily choose some meals for that week. Each week go through your fridge, freezer and cupboard and do a stock check. You may have sausage, chicken in the freezer and a whole bag of potatoes left in the cupboard which means you won't have to buy for two meals that week. If you have any food which is coming to it's sell by date cook it and freeze it so you can eat it at a later date and the food doesn't go to waste. You might also have four jars of pasta sauce as its easy to forget what you already have in the cupboard. Make sure you write down everything you have so you can easily keep track when doing the food shop. Up until a couple of years ago I have always done my food shop at Morrisons, simply because I knew my way around the store and it's the closest to me. But now I will do a shop online with Tesco as it's very convenient with kids. Also by doing it online, I actually have time to sit down and go through it properly, and go back and delete things from my basket which I don't really need, where as in the supermarket I would just throw everything into my trolley to rush and get out with the kids playing up. Aldi is known for it's cheap brands and many people have switched over and never looked back! You need to work out whats best for you and find the supermarket that you are comfortable with to start finding the deals. Each supermarket varies in prices, however some are typically cheaper than others. It's important to use a comparison tool such as mysupermaret.co.uk to ensure that you're getting the best deals. Comparison sites are really easy to use and all you need to do is add all the items you'll need for the week to your shopping basket and check the switch and save option on the right hand side of the page. This will then show you how much your shopping will cost at each supermarket so you can switch and save money! I did it for the first time not long ago and managed to save £30 on my first time and on average save £10-15 a shop! By doing it this way you can then choose where to get your shopping delivered from instead of having to put it in manually on each website. You can then select the £1 delivery options which are usually off peak times to save even more money. What time of the day do you do your food shop? If you are after further reductions and wanting to reduce your food shop even more it's a good idea to know what time the reductions begin at in the supermarket. Reduction times vary at store to store but the same patterns emerge. After the morning rush around 10am the first lot of yellow stickers will start to appear, leading to 50% at around 4/5pm and then an even further reduction at 7/8pm of up to 75%! I know many people who do their food shop last thing at night but you can't always guarantee that the supermarket will have everything that you need. If there was only one piece of advice I could give you, it would be not to do you food shop on an empty stomach. I now eat before doing my shop as then I'm not tempted to buy everything I see and tons of junk food. I started doing this and I have noticed that the food shop had decreased and pretty much cut down to half of what I was paying before! I have such a sweet tooth so can easily get persuaded buy special offers on junk food which I don't need! This is something I used to do reguarly and need to get back into doing, but by using the slow cooker and freezing the left overs or having them again the next day saves me a lot of money. This is one thing I've never been very good at sticking to. I'm not a cook, and I'm rather lazy to be honest. I have however recently got back into cooking and starting to make more meals from scratch for example, stir fry, chicken casserole, curry, chilli con carne all of which the kids will now both eat depending on their moods! Cooking for scratch is much cheaper than buying ready meals and will save you money in the long run. A simple way to cut your budget is to switch brands. Especially if you usually buy the finest range or well known brands. Perhaps go down to shops own or even the savers range if you really want to cut down your budget. Of course you don't need to do this for even item you are wanting to buy but maybe just start off with a few items every week and you can see where you are saving money. You can compare your basket online through comparison sites such as My Supermarket which then allows you to see where you could be saving money. This doesn't mean going completely vegetarian, but what about leaving out the meat a couple of times a week and having fish or pasta on its own instead? There are thousands of meat free recipes available online, why not have a look on Pinterest. By having a few meat free meals a week you could save at least £10 a week! Take advantage of BOGOF offers but only for items your actually buy and use. This is a great opportunity to stockpile items you would usually buy for example if a pack of 9 loo rolls which you usually buy for £3.99 is reduced down to £1.99 you're getting double the amount for the same price! Batch cooking is great for anyone especially busy parents whether you've just had a baby or work long hours, spend one day a week or month preparing dishes for the rest of the week or month. These can be freezer meals which go straight into the freezer and you take out at a later date and they go straight into the slow cooker so you don't have to worry about preparing everything when you get home from work. Another great way to cook in batches is to double the recipe and freeze a portion. You don't necessary have to double the meal as this could end up expensive, but throw in extra veggies and potatoes/rice and it will only take you a few extra minutes. I'd definitely recommend doing this, there's so many meals that you can batch cook such as soups, chilli, casserole, curries, hot pots the list is endless! Instead of spending £2 on a packet of grated cheese grate it yourself and you'll save yourself a lot of money in the long run. Same goes for ready chopped vegetables such as onions, carrots and broccoli, instead of a packet of broccoli for £1.25 you can buy a broccoli for as little as 40p and cut it yourself! This is something I've only recently started doing, I don't do it every month but if you think you could manage it skip your food shop one week a month. Of course you'll probably need to pop in to top up on essentials such as milk, bread and veg but make use of what you already have in the cupboard and your freezer! I like using Supercook to find recipes using the ingredients I have left over. This simple tip could save you at least £40 a week depending on how much your usual weekly shop is. If you like to shop in store take the money with you to the shops and don't take your card then you only have that money to spend. For example if your budget is £50 for the week and you want to stick to it, take £50 in your purse and leave your card at home. Take a calculator so you can add up along the way or most supermarkets have those handy handheld devices which add up as you shop. I have always been bad for popping to the shops for milk and bread and ending up spending at least £50 so now I just take in enough money for milk and bread to avoid unnecessary purchases. Towards the end of the week if you have lots of vegetables left over in the fridge cook up a soup or if you have a young baby make some pureed vegetables to freeze. This is a great way of using up the left overs and bulk freezing for days where you don't fancy cooking or don't have much left in to eat meaning you won't need to pop to the shops for extra meals! With buying less, that means less wastage and less items going out of date and ending up in the bin. I was really bad for this with fruit and veg and bread. I now buy frozen veg and only buy enough fruit to last us before they will go out of date. With the bread I now freeze half a loaf and still buy a new loaf the following week but I find it doesn't get wasted this way. If you have potatoes left over at the end of the week mash it and freeze it. You can also freeze eggs and many other items too. You know them annoying leaflets you get through your door every so often, yes those! Well they are full of coupons and money off vouchers which are worth using. Some of them are useless and some only give you a few pennies off but it all adds up. Also with Tesco vouchers you can trade them in and use them on other products! Also hundreds of free coupons are available instantly online check out google for lots of great voucher sites. Look for coupons on already-discounted products, as they'll help! Buy one get one free - Know when to use these promotions properly. For example on toothpaste, loo roll, stuff you can store in the cupboard that won't go off and will come in handy. Don't get too over excited and take up every offer as you'll just be spending for the sake of it. 18. Use Quidco to get free cashback! I also started using Quidco (Ebates if in the US) properly and got cashback on purchases. I also use their ClickSnap feature which shows me some offers that week which you can recieve cashback from. If you sign up to Tescos delivery plan you can also recieve £5 cashback, and you'll also get £2.50 cashback if you sign up as a new customer. Ocadao, Morrisons, Approved Foods, Waitrose and many other supermarkets all offer a new sign up cashback offer so it's worth signing up and searching "Groceries" and you'll see where you can get some cashback. Grow fresh herbs indoors and you'll never have to spend money on herbs at the supermarket again! You can even get the living plants which will be a one off purchase but then they continue to grow if you look after them meaning you won't have to buy them again. 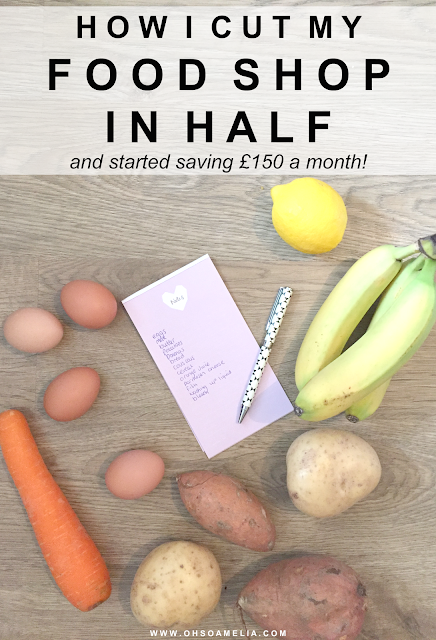 So there you have it, how I cut my food shop in half and started saving £150 a month! Just think what you could do with an extra £150 a month! Do you have any money saving tips to share when doing the food shop? For more money saving tips check out my Money Saving/Budgeting Pinterest board here. Great tips Kerry. I really need to cut down, I don't know how I spend so much! Last week I meal planned and still ended up spending £90! Two of the recipes I used had beef tomatoes as the ingredients which cost a fortune, I really should have just ignored the recipe and bought normal tomatoes for a fraction of the cost! Ive recently been trying to cut down on spending recently. So this is a great post for me! Great list of tips thank you! great tips - i try to batch cook too! We started doing all of this recently and it has made such a huge different! Our shops are so much less than what they used to be because we're not buying things we don't need! There's some really great tips here, we also shop around and regularly miss a week when we can, we also freeze milk so we don't ever run out- kids with no milk for cereal would be no fun! It's more challenging with three kids now especially as one is intolerant to many things so his food is uber expensive. But we have cut down our bills a lot. We have been doing the weekly menu thing for ages, and it really does work! We keep our weekly bill to between £40 and £50, and very rarely have to throw anything away! Great tips, have noted them all down! A lot of great tips. I struggle to find the time for a lot of things like shopping around. I find the easiest way for us to save money is to go down a brand. Great tips, thank you. I'm a great believer in stocking up on washing powder, toilet rolls, kitchen rolls, loo cleaner etc. when they are on special offer - this saves me a fortune. I've lost track of how many years it is since we used a full price loo roll! No wonder you were spending a fortune if you weren't already doing this! Pre-prepared veg, cheese, etc are the absolute worst money-wasters. Oh and pitta bread pizzas (or stuff them with ham and cheese for pitta pockets) are great for kids and quite cheap. Love your saving money tips. I really need to get back into meal planning. It really does help doesn't it. Great post. I usually spend 30 to 40 a week for myself and 2 children. The big key is not to waste food and cook from scratch. 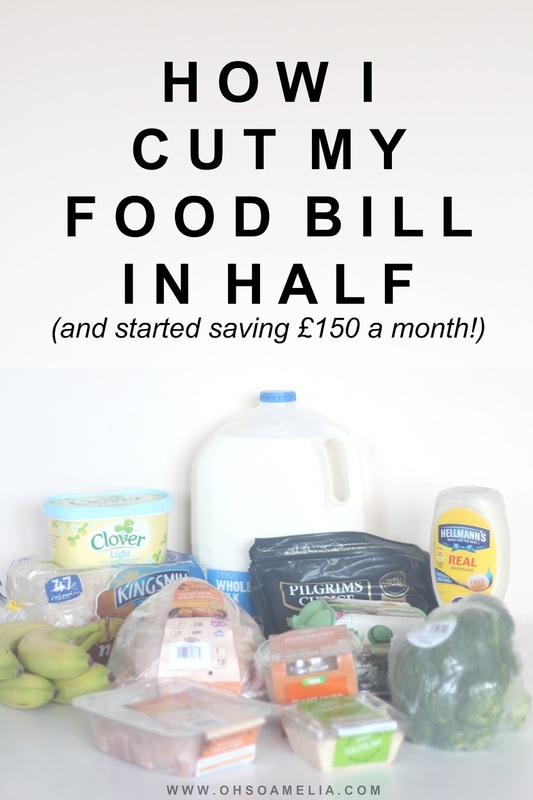 I started to cut our food bill down just over 12 months ago as it was getting out of control. So easy to do a big shop then two days later be back in the shop buying "one or two" things and spending another £20 or £30! Meal planning is good & also making sure you put things you won't use in the freezer, I used to be awful at forgetting about what I'd bought and having to throw it out. Glad you are managing to save so much a month, well done! Great tips Kerry. We mainly use value brands when we can as have found them to be just as good. A lot of great tips, I have been trying to save money on food shopping but not really made much of a dent yet. Being unemployed that magically lowers my food bills, lol, but a big thing for me has been using sauce packets to make basic batch meals and taking advantage of frozen foods. We used to do all our shopping at Morrisons but now we shop around and we spend less than half of what we used to. I really am at my wits end with our food bill. Might start using cash i think. Great tips, most of which I use, I bulk by all my meat and with a meal plan for the month, split it into potions and freeze, butchers will do 'catering' packs that work out a lot cheaper. I do a lot of these things but I had never thought of growing my own herbs which in any case would be much better than the dried variety. Good idea ! Some great ideas. Food shopping seems to cost more. Great tips - I have just bought a slow cooker and love it! I've cut down quite a lot. There is only three of us but I'm a big chap and we're all quite fussy so I'm very happy that I can usually get our weekly shop in between £60 and £80. Although I occasionally have one of those £120+ weeks which always seem to occur when we're short of laundry detergents etc. Will definitely be trying out some of these tips,our shopping bill has been creeping up recently and need to get back to a stricter be budget. some great tips, thank you! Some good points, well made. Great tips. I try to never go shopping while hungry otherwise I end up buying more. Great tips, I love coupons and meal planning is essential. Thanks for sharing, fantastic post. A very interesting post, thank you! Cook once, eat twice is my motto! I'd never have thought of use comparison sites for groceries. Thank you for such great advice. Really useful tips - thank you! I swear by my slow cooker now. With two young ones, its particularly helpful. As well as cost savings, there is the benefit of healthier pre-prepared meals. Excellent! In simple terms, I realised that food is the most fundamental need for a person. In difficult economic times, people's priorities change, and they might be willing to do something that secures for them the lowest possible weekly food bill. Thanks for your tips! I really love your blog! Yeah, I'm a father but yeah... I have to save money for my kids too. Best wish for you. One thing I really find useful is going to the local green grocer's on my high street. For almost a year I've been going to Tesco by default - then one day I ventured into the grocer's and found everything was much cheaper. Plus, it means you're shopping with less packaging and plastic on everything, so less waste.